I am back in NYC, and yes, wondering why. 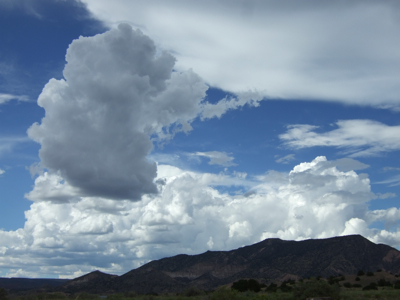 That is easily answered with my job, but it seems that New Mexico has so much to offer, number one on that list is expansive space. This is especially noticeable when my neighbor’s window is only about 25 meters from mine. Anyhow I ran yesterday, the first time in 3 weeks since last trying to run. It felt good. I did 30 minutes, 1 walking / 1 jogging without any pain, I will take anything I can get. It was a fantastic feeling and gave me optimism. If only I was in NM, I bet I could run all the time. My dogs could run all over the trails rather than drag me around on the cement putting extra torque on my bones, and I would have 1000’s of miles of dirt. I decided to put myself on the 5 year plan to move there, or if I am lucky the expedited 3 year plan. I often hear the comment that runners are a superstitious bunch, and I am going to add to that. On my last day in NM I went to Chimayo a town famous for El Santuario where it is believed by many to be the site of a miracle which occurred about 200 years ago. Miraculous healings are believed to have occurred at the site where a wooden crucifix was unearthed. Almost half a million people come every year to this tiny church where you can collect “holy dirt” from a hole (no pun intended) in the sanctuary floor. On the walls are lines of photographs of ill or injured people, crutches, walking boots, prosthetic limbs, all kinds of medical aids. You can bring a bag or buy a little box in the gift shop to collect the dirt and take it with you. The day I was there they had free used up candles from the offering stations. I took one of those, gave a money offering and gathered some dirt wiping off the excess on my hands and arms. I thought it would not be a good idea to stick my hand down my pants to rub dirt on my hip while in the church so I waited until I got in my car. I should note I am not religious and know little about catholicism but holy dirt sounds much more interesting than holy water. Now my morning routine included, side leg raises, clams, single leg bridge and rubbing dirt on my groin and hip. Hey, you never know it just might work. 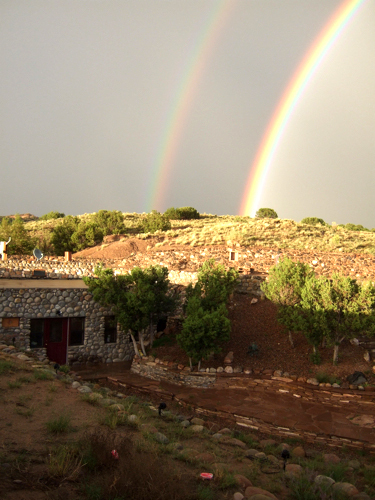 I arrived at my new home in Abiquiu 9 days ago. It already feels like it has been a month; in a good way. I have met many of the neighbors, and local business people, local being within 20 miles or so. I could not ask for a better neighbors than Pat and Steve. Pat has taken me all over and has made my transition here, no matter how short it is might be, very smooth. On Wednesday I replaced a window in the house and began weeding the stone levels. I am not sure what to call them, but imagine 4 stone steps, 30+ feet long and 4 feet deep with dirt on top. I pulled the weeds from the top one and planted a few seeds, who knows if they will grow the soil is all sand and very very dry. But weeding must be done early in the morning because the sun gets so hot I just bake. And baking I am, my skin is turning a wonderful shade of deep brown. 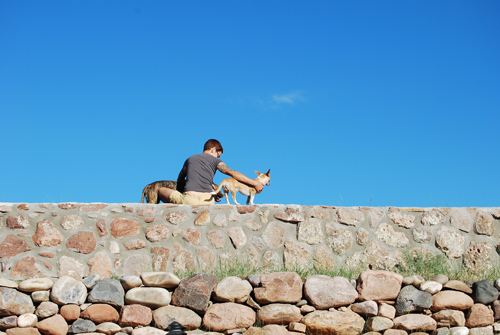 Yesterday Eileen came up from Santa Fe to stay the night. We have known each other for about five years. 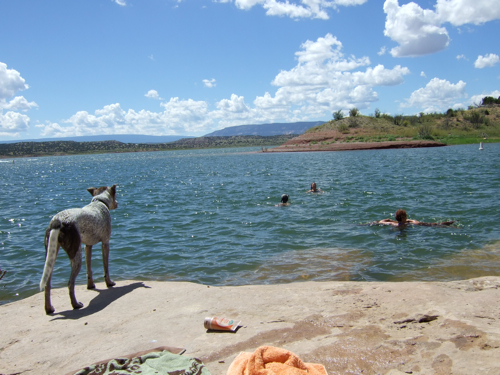 We met her friends at the Abiquiu Lake and spend 5 hours swimming, sun bathing, and splashing around with their dogs. I just kept thinking about how it would be the perfect Ironman training ground, 5,000 acre lake and endless trails and roads. Each day I have met at least one person who is riding the Continental Divide Trail on their mountain bike. It turns out you can ride the entire distance and only 10% of it is roads, the other 90% is off road including old logging roads. I just wish I could run. This would be the ideal place. My hip feels good and I decided to postpone or cancel my repair of my labrum. The bone is still healing but it feels like the hot sun and relaxation I get down here is speeding it up. My hours of naked sunbathing I am sure helps. I get sun directly on my hip. The great thing about where the house is and even where we went swimming is that you do not seen another person. The privacy is like none other I have experienced. About two miles from my house is Poshuouinge, the site of Indian Ruins from the 1500’s. 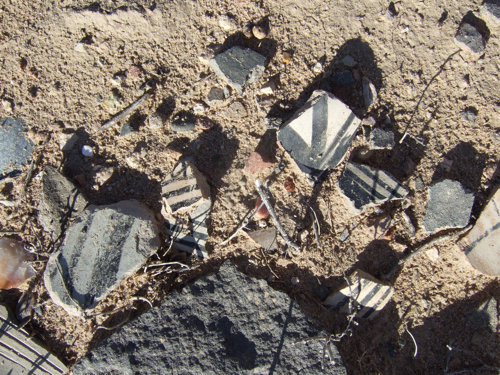 It is pretty amazing as you can see the stone footprint of the village and there are a huge amount of artifacts still scattered along the ground. 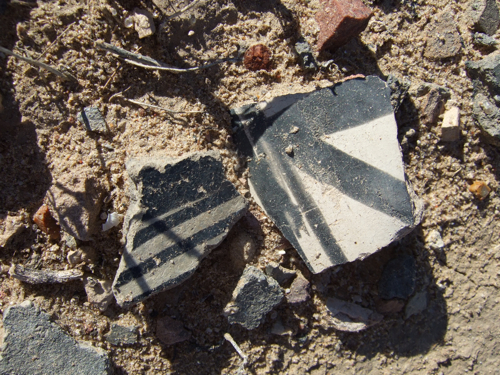 Below are a couple photographs of broken pots. I do not have a phone or internet yet. I am writing this from the El Rito library, 12 miles from home. It is funny 12 miles does not seem like much. 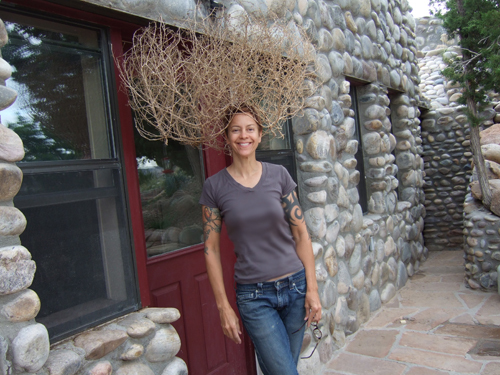 And lastly my modeling of the latest in Southwestern headwear, the tumbleweed tiera. And of course this is the front door of my stone house. Hilary modeling the lastest in headwear. Booked flight to New Mexico. 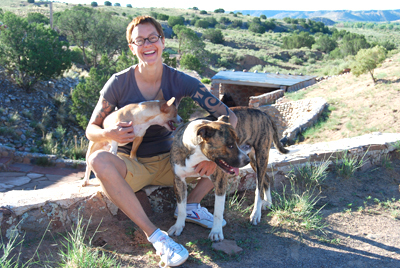 Booked boarding with my favorite dog wrangler and trainer Kat Berger. Today I saw my orthopedist, Dr. Donald Rose. I knew already what was coming. I had my followup MRI done last week on my left hip which has a stress-reaction injury on my femur. My first MRI was in May and I am surprised that I was not 100% by now. I have run a little bit, starting with 100 meter jogs and spending 5 weeks to build up to a mile. Talk about a slow build-up. But I was bugged by a nagging ache along the inside of my hip-bone that intensified whenever I squatted down. I kept digging at it thinking it was my psoas but it never changes. On August 27th I went for my follow-up MRI. When I got the report I went into a rage and depression. The second report included “unchanged ganglion cyst and tear at the base of the anterior labrum.” What do you mean “unchanged” there was never a cyst nor a tear reported! Dr. Farzam Kashanian at Lenox Hill Radiology read my May MRI. He wrote about three vague sentences and my injury did not sound too bad. But when my doc looked over those films he said it was much more severe than Kashanian stated. The report was less than 2/3’s of a page. My second MRI read by another doc in the practice (I have look his name up Greogry ??) is two pages long and not only details the tear, he specifies which film sequence it is in. He compared the two films stated what is unchanged or changed. Oh man I am pissed. I would have had this taken care of back in May. But rather I sat here all summer healing my bones while the tear is what is holding me up. So now I am going to NYC Hospital for Joint Disease Sept 14th to have that fixed and then going back to the 100 meter build up. Hopefully it will be better than that. I had a friend get both hips done. The first one she was on crutches one week, the second one she walked home with a cane and was off it the second day. The good thing is you have to work the leg immediately, no sitting around. I asked if I should board my wild dogs and the doc said, “no, it will be good for you to hobble around with them and if they are too strong, get a friend to walk them and you hobble along side.” In other words I hear 30 minute surgery, go home, sleep an hour, get up and get the leg moving.